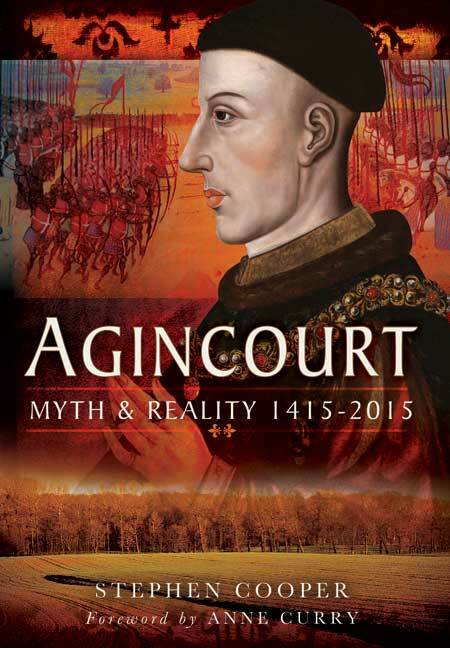 You'll be £19.99 closer to your next £10.00 credit when you purchase Agincourt Myth and Reality 1415-2015. What's this? The overwhelming victory of Henry V's English army at Agincourt in October 1415 has passed into myth – as one of the defining events of the Hundred Years War against France, as a feat of arms outshining the previous famous English victories at Crécy and Poitiers, and as a milestone in English medieval history. This epic story of how an exhausted, outnumbered army, commanded by an inspirational leader, crushed a huge French force on French soil has given rise to legends and misconceptions that make it difficult for us to reach a clear understanding of what really happened on the battlefield 600 years ago. But that is what Stephen Cooper attempts in this thoroughgoing, perceptive and fascinating reconstruction and reassessment of the battle and its history. In graphic detail he describes the battle itself and the military expedition that led to it. He examines the causes of the conflict and the controversies associated with it, and traces how the story of the battle has been told over the centuries, by eyewitnesses and chroniclers and by the historians of the present day. As featured in the Yorkshire Post, The Star (Sheffield) and Rotherham Advertiser. ... I found it refreshing to find a book of this nature that doesn't automatically follow the most radical line on each issue - this starts with the section on the location, where the author concludes that the evidence for the traditional location is stronger than the evidence for any alternatives. This makes the author's views elsewhere all the more credible. This book covers a wide range of interesting topics, and the author comes to convincing conclusions on each of the key topics. The section on the historical reputation of the battle in England, Britain and France is of great interest, as is the chapter on the important role of London in the English war effort. Overall this is a useful addition to the literature on this well studied battle. For those better versed in the Hundred Years War, the book is worth picking up. Provides an excellent reconstruction and reassessment of the battle and its place in history. Lawyer Stephen Cooper here presents the case for Agincourt to the court of historical opinion. It is an emotive and stirring subject, and Cooper does it justice in this clearly written account. This enjoyable book serves as a highly readable survey on the meaning of Agincourt, an event that will retain a high profile long after the 600th anniversary events have faded away. For wargamers, if [your] interests stretch into historiography and the construction and uses of historical events, then this book will provide a readable and enjoyable experience. At the time of the imminent 600th anniversary the book provides a great deal of information about Agincourt and its impact, which many of those who are interested in late medieval warfare will find interesting and thought-provoking. In this fascinating and highly readable study, Stephen Cooper does much more than retell the story of the battle of Agincourt. Based on a solid reading of the sources, the book provides thoughtful reflections on the reality of the battlefield, the myths that arose around it and the contributions of modern scholarship. A lively and insightful study, which asks interesting questions and provides thoughtful answers. Stephen discusses disputed and tantalising aspects of the battle of Agincourt, what went before, and after, at great length and in the most minute detail. To achieve this he has read, digested and summarised an amazing array of facts and opinion. He has consulted more than 70 primary sources and more than 180 books and articles. The result is a magnificent achievement: a triumph of research, writing and publication. I commend it to you. Thank you. A fascinating read. 'Agincourt: Myth & Reality 1415-2015' satisfies on many levels - as an intriguing interpretation of history and a cross-section of classical literature. A timely reminder of one of the greatest ever military triumphs. Stephen Cooper is an Oxford graduate, lawyer and civil servant who has previously written on life in eighteenth-century England and on English crime and criminals in the nineteenth century. But his main interest has always been in medieval history, and he has made a close study of the Hundred Years’ War and of mercenary warfare in medieval Italy. His most recent book is Sir John Hawkwood: Chivalry and the Art of War. He currently lives in Yorkshire.